It has taken 30 years of loving restoration to save the early Christian art of the 6th century Basilica di Santa Maria Antiqua in Rome. Nestling at the foot of the hill where Rome’s emperors once lived, the church was buried under rubble by an earthquake in 847 and only uncovered in 1900. It is called the “Sistine Chapel” of the early Middle Ages because it collected the very best of figurative culture of the Christian world between Rome and Byzantium – and has escaped the constant updates performed on other historic buildings in Rome. Now it is open to the public for the first time. “This church has stayed intact, untouched, even if heavily damaged by the passage of time. This makes it, at once, extremely interesting and in constant need of methods that can enhance its visibility and understanding,” says Medieval and Byzantine Art historian and exhibition curator Maria Andaloro. Among the treasures is a depiction of the Virgin Mary with child, one of the oldest known Christian icons in the world, which was moved to another church in Rome after the earthquake but has now been returned to Santa Maria Antiqua. To coincide with its re-opening a multi-media exhibition using modern technology such as 3D projections show the spectacular history of the church through its different layers of development. One wall projection shows how a depiction of the angel Gabriel telling Mary she had been chosen to be the mother of Christ was painted on top of a pre-Christian Byzantine queen wearing a crown and a pearl-covered gown. 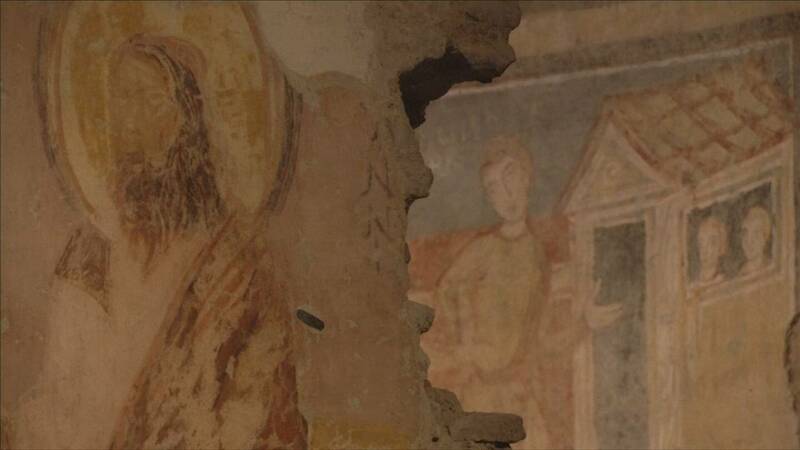 ‘‘The effort we made was to use modern technology, like 3D projections, we have tried to integrate all paintings and all different phases, offering to the public a way to visualise the history of the church, as the various layers of painting succeeded one another as time passed and new work was commissioned by different actors,” says Medieval Art historian and exhibition curator Guilia Bordi. The walls of the basilica show saints and martyrs, madonnas and queens, popes and emperors in a rich display that remained frozen and undefiled over the centuries. One part of the church focuses on the narrative story of the life of Christ followed by stories of the saints and martyrs, whilst the second section displays the extensive collection of icons. The current exhibition “Santa Maria Antiqua tra Roma e Bisanzio”, runs until September 11.